Can a Cordless Stick Vacuum Replace a Corded Vacuum? When I tell people that my Dyson V6 Animal cordless stick vacuum is the first thing I'd save in a fire they always laugh. But I'm not joking, that's really how much I love this thing. It cleans just as well as any corded upright I've ever owned and converts to a handheld that, in conjunction with the small, powered brush head that's included, makes it awesome for cleaning upholstery and cars. Yes, it only has a 20-minute run time, but that's never been an issue for me. It's so light and maneuverable that I can zip around my 1,800 square foot house in much less time than that. Most expert testers have long asserted that stick vacuums can't fully replace a corded upright but, as my experience shows, it definitely can. Dyson apparently agrees with me, as the company announced in March that they are no longer going to develop corded vacuums. The big question people seem to have is which cordless vacuum will work in their home. While I think the best advice is to buy the most powerful stick vacuum you can afford, some cordless vacuums are simply too pricey for many people. 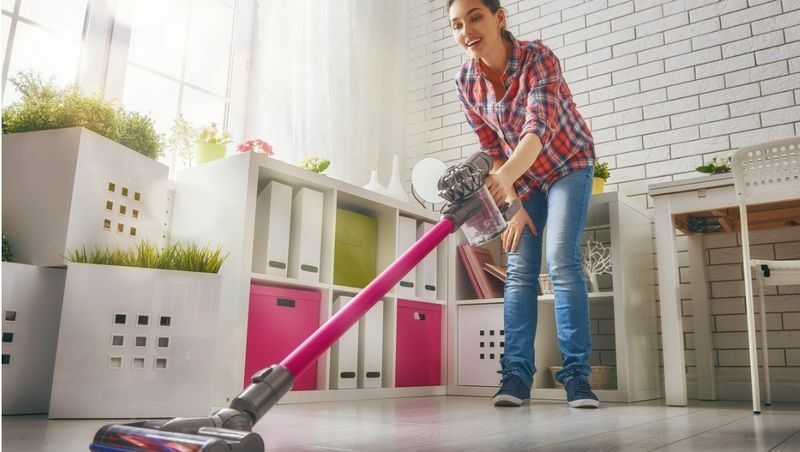 The guide below offers some options at two different price points to help you find a cordless stick vacuum that will clean your whole house without cleaning out your wallet. Better: Dyson V8 Absolute (Est. $450). With a powerful motor and a 40-minute run time, the V8 Absolute is the first vacuum we've seen experts give the nod to as a replacement for a corded upright. It's not only a top performer on both carpet and hard floors, it also includes a vast array of accessories. This is the vacuum I'm going to buy when my V6 finally conks out. 5.7 pounds. If you want to go even lower in price, or just don't feel as if a cordless stick vacuum is powerful enough for your needs, take a look at our newly updated stick vacuums report for some suggestions for very lightweight corded vacuums. Our Best Reviewed Shark Rocket Complete HV382 (Est. $200) is incredibly versatile and weighs less than 10 pounds, while the ultra-cheap Bissell PowerEdge 81L2T (Est. $70) is also super light at just 7.5 pounds. And you can make your cleaning days even easier. In addition to my V6 Animal, I have an older iRobot Roomba that is still going strong after three years; when it dies I'm going to replace it with one of our Best Reviewed robot vacuums, the iRobot Roomba 690 (Est. $375). Between the two vacuums, I spend a lot less time cleaning than I used to. Oh, and did I mention my mopping robot, the iRobot Braava 380t (Est. $300)? When that fire starts that's what will be in my other hand.